The K-mount was introduced in 1975. Since then, every 35mm Pentax lens preserved mechanical compatibility with this venerable mount. The first generation of K-mount lenses, bearing no special labeling, are nowadays referred to as the K line. 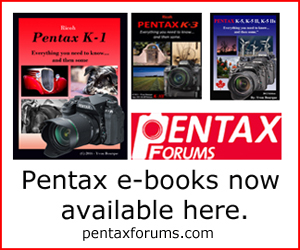 Two years after the inception of the K-mount, Pentax released an upgrade to their entire lens lineup. Called the M line, these lenses are generally comparable to their K counterpart, but with a smaller size. 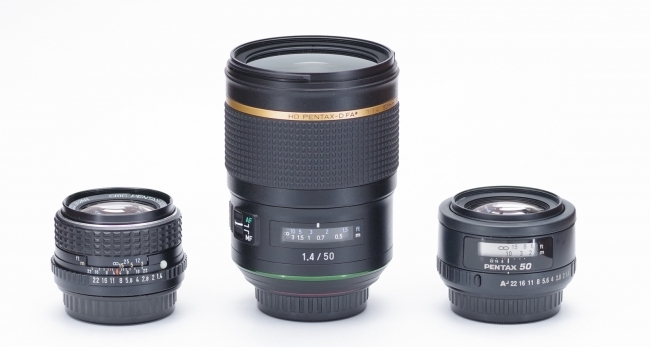 The M lenses are probably the most common of the purely manual lenses made by Pentax. After these came, around 1984, lenses with automatic aperture control, labeled the A line. They are otherwise very similar to M lenses. Around 1989 came the first autofocus lenses, called F lenses. Then, in 1991, Pentax launched their last generation of lenses before digital, the FA line. Each of these generations is unique in some way or another. But they also have many things in common. In particular, they all include a few lenses with the same focal lengths and apertures. At the center of this is the ubiquitous 50mm F1.4, a type of lens common to almost all generations from all manufacturers. Pentax is no exception: each of its generation of film lenses includes such a design. The two most common versions are probably the M and FA. The former is relatively easy to find on the used market (though the cheaper F2 and F1.7 versions are more common). The latter is still available new. However, it has recently been superseded by a newcomer: the D FA* 50mm F1.4 SDM AW. While 50mm lenses are always more or less comparable regarding their optical design, this new 50mm is a clear departure from what was done before. Significantly larger, doing away with the double gauss optical principle and including weather resistance and silent autofocus, the D FA* 50mm is a no-holds-barred product that should be many steps ahead of any other 50mm before it. It is part of Pentax's STAR lineup, intended for professionals and demanding photographers. With the release of the Pentax K-1 full frame camera and, more recently, of the D FA* 50mm, it becomes interesting to take a look at how the 50mm design evolved over time. Can the older lenses still compare with their more modern counterparts? The FA50mm is a lens more than 25 years old, with little modifications since that time. The M50mm for its part is 40 years old. Both are still very well regarded today, as can be attested by their scores of 9.26 (M version) and 8.86 (FA version) in our user database. In this comparison, we will look at how the lenses themselves evolved, but more importantly how their optical performances changed. Comparing the M, FA and D FA* lenses, we will look at sharpness, aberrations, vignetting, distortion and bokeh. We will also take a look at how each lens handles with a modern camera.